Beware, earliest planting date for coverage for replanting corn is April 11. With the continuing record-breaking temperatures and sunshine warming soils this year, some farmers may be thinking of planting their crops earlier than usual. Climatologists and meteorologists, and many other people, will remind us all that we could still get severe frosts. Regardless of these warnings, some farmers have and/or may plant early. If farmers choose to plant early, there are crop insurance implications according to Paul D. Mitchell, University of Wisconsin-Extension agricultural economics specialist. CORN PLANTING DATES: This map shows the crop Insurance "Earliest Planting Date" for corn by county. Dark green area is April 21. Light green area-April 11. He noted, "Most Wisconsin farmers buy crop insurance for their major crops, such as corn and soybeans, with a sales closing date of March 15. Among its many details, the crop insurance contract specifies an 'earliest planting date.'" For corn, the official RMA earliest planting date is April 11 in most of the state and April 21 in the far northern counties (see the map below for details). 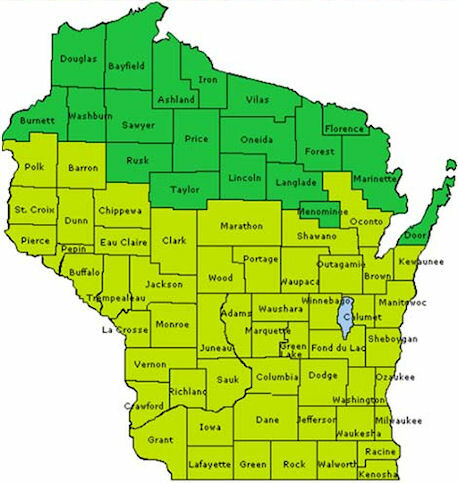 For soybeans, the official RMA earliest planting date is April 26 for all Wisconsin counties. If soils warm up and this warm weather continues, some farmers may want to plant before them. For spring seeded small grains and forage seeding policies, no earliest planting dates are used. "If a farmer chooses to plant earlier than the specified earliest planting date for the insured crop in their county, the crop is still insured and losses will be covered, as long as the farmer follows all the remaining contract specifications," Mitchell said. "However, the farmer gives up eligibility for replant payments that are part of the standard yield protection and revenue protection included in these combo policies." Specifically, if a crop stand is damaged early in the season so that the projected yield is less than 90% of the yield guarantee, a farmer can receive an indemnity for part of the actual cost of replanting. The affected area must exceed 20 acres or 20% of the unit's acreage. The maximum indemnity is the chosen price election multiplied by the 20% of the yield guarantee, up to 8 bushels for corn, 3 bushels for soybeans and 1 ton for corn silage. This year, based on crop insurance prices of $5.68/bushel for corn and $12.55/bushel for soybeans, these allowances imply a maximum replant payment of $45.44/acre for corn and $37.65/acre for soybeans. Farmers who plant before the earliest planting dates give up their eligibility for these payments if they were hit with a late killing frost or similar problems that would normally trigger replant provisions. Note that the yield guarantee is not reduced for late planting reduction if a farmer replants crops under policy replant provisions, so the crop has the same production guarantee as for the original plant date. Farmers with additional questions should contact their crop insurance agent. If the warm weather continues, growers will have to weigh the risks and benefits of planting early. For farmers with crop insurance coverage, which is most Wisconsin farmers, one of the risks of planting early to consider is the loss of replant coverage.